Blurb Description: "The Haters are coming to destroy all life on Earth. It is not a question of if, but when. 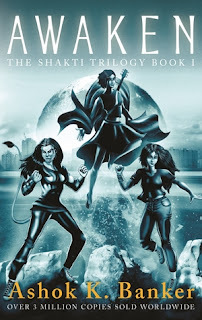 First in the thrilling Shakti Trilogy set in contemporary India, Ashok Banker’s action-packed and brilliantly imagined Awaken introduces our unlikely heroes who must discover and harness their superpowers before they can protect and preserve the Earth from the wrath of a menacing alien invasion." I’ve had this book on my TBR for a few months now. I tried reading the book a while ago, but for some reason I just couldn’t go through with it until today. I’d like to thank Pan Macmillan India for sending me a copy of this book, although my opinions are unbiased and entirely my own. Awaken was, if I had to describe this book in a word, STRANGE. More importantly, it felt like this was the first or second draft while writing a novel and then all the fine tuning that comes after DIDN’T EXIST. This book was filled with broken English, phrases like ‘OMG OMG OMG’ and ‘super wow’, a few racist comments and THE WORST VILLAIN ALIEN RACE NAME OF ALL TIME. LIKE SERIOUSLY. There were so many strange terms being given to everybody in this book including but not limited to The Haters, Preservers, Friends, Guruji’s Goons (??) and the Kindred. As a HUGE fan of superheroes and villains, I WAS SO SHOCKED THAT EVERY GROUP OF PEOPLE NAMED IN THIS BOOK HAD A CRINGE WORTHY NAME. Awaken is the first book in a trilogy and it’s also the first book that I’ve read by Ashok Banker. It’s told from the point of view of three girls – Kiara, Saumya and Sia, and the strange powers they’re coming into and aren’t sure what to do about. I won’t deny that Ashok Banker deals with a lot of important issues that Indian Woman/ brown girls face including being objectified, racism, the fight for freedom and even being trans, but IT WAS ALL DONE A) SO QUICKLY AND B) It just felt unfinished. Like the rest of the book. As if there weren’t proper rounds of editing to make this book what it COULD HAVE BEEN. Honestly, I don’t think I would’ve read this book if it wasn’t a review copy. It just didn’t resonate with me despite the fact that I WANTED THIS BROWN GIRLS WITH SUPER POWERS TO BE A FAVOURITE. It was a half done piece of work and I WISH it was more. I don’t think I’ll be reading the sequel. 2 stars. Ashok Kumar Banker (born 7 February 1964 in Mumbai, India) is an author and screenwriter. His writing spans crime thrillers, essays, literary criticism, fiction and mythological retellings. The author of several well-received novels including a trilogy billed as "India's first crime novels in English", he became widely known for his retellings of Indian mythological epics, starting with the internationally acclaimed and best-selling eight-volume Ramayana Series, which has been credited with the resurgence of mythology in Indian publishing. The New York Times credited him with making mythology the most successful category in Indian publishing, describing his work as being "better written than many books in the genre that have followed – introduced the Ramayana to a new generation of readers. His books have sold over 2 million copies and have been published in 16 languages in 58 countries. What are some of your favourite books with Indian Characters? Are you looking forward to any books in 2018 with brown characters? I'd love to hear your recommendations, and see if I've missed out on any!